Rider Activity Guide » The Search For The Perfect Bloody! The Bloody Mary, and we are not talking about conjuring up a dark ages screaming banshee in our mirror, but the ultimate weekend beverage that inspires simplicity to the downright bizarre. There are so many claims to who exactly invented the delicious lazy AM cocktail range from a French bartender Ferdinand Petiot to New York’s 21 Club that it’s hard to pinpoint exactly when this cocktail was invented. I prefer to think the Hair of the Dog theory that the Bloody Mary was concocted to be the perfect antidote to shenanigans on a Saturday night by getting your Sunday the jump start it needs. 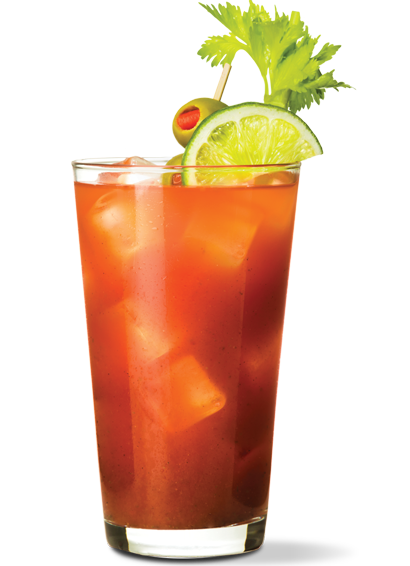 So that being said, I contacted my good buddy the German to help me in discovering the best Bloody Mary in the Illinois area. The German has dedicated his weekend scooting experience to finding that perfect blend of tomato juice and vodka with the exquisite amount of spices. Throw in a sausage stick and the garden and you have a meal in itself! First up on my quest for the concoction is Uncle Ritchie’s in Lockport Illinois. An old river city nestled between Rte 171 and Rte 7, this unassuming bar is the antithesis of the chrome and fern bar that you may think a Bloody would be served. Described as a “Hole in the Wall” the Uncle’s staff takes the perfect blend of juice and spirits, swirls in the sauce, sprinkles the pepper and tops with the standard garden of celery and olives. It is unassuming but oh so delicious. Second is the Last Chance Saloon in Millington Illinois. The Last Chance Saloon is smack dab in the center of a quaint Illinois town that you probably will not be too successful Google mapping it but the ride to the Last Chance is worth it. This saloon, that slaps a square pocket from long ago jeans on the bar will be the friendliest town bar you could ever go to. Besides having some dynamite fried green beans to munch on they have a perfect Bloody Mary. Sip on this great cocktail while kicking your feet up in the outdoor patio and you have the best tonic for what ails you. Now these bars mentioned above are not pretentious or look at the Bloody Mary as a circus, but offer the blend you are looking for. That leads me to the Route 12 Bar and Grill in Fox Lake, Illinois. The ride to this establishment in Northern Lake counties take you on some twisty turns and beautiful landscape that will work up a thirst. This is the home of the MEGA MARY. And by mega I mean HUGE! It’s a meal in itself! Heck its breakfast, lunch and dinner! Only available on Sundays this $12 masterpiece is crazy good! First off they also have the generous blend of juice and spirits then the building starts. The typical salad is splashed into the glass along with cheese, smoked sausage, pickles and olives but then the libation is topped off with two sliders! Sausage and beef precariously perched on the glass, these additions can elicit many groans and wide eyed amusement; it’s a conversation starter! Add the famous sausage straws and you have a masterpiece! 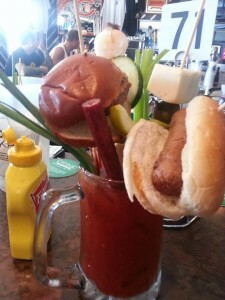 I have only listed three great Bloody Mary establishments and I am sure you have your favorite. Contact me at judy@mc-rag.com and shoot me your best Bloody Mary destinations. Just like “The German”, I am in search of the best! Ride Safe, Drink Responsibly and Have a Great Time! 58 queries. 37.75 mb Memory usage. 1.080 seconds.